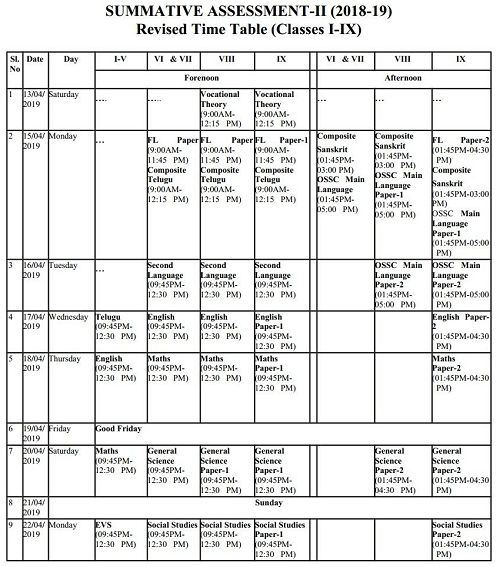 AP Summative 2 Exam Timetable of 9th, 8th, 7th, 6th Class Subject Wise Exam Dates on April 2019. SA 2 Exam conduct state wied all Districts by AP SCERT. DCEB announced Summative 2 Class Wise Exam schedule. High School/ UP Schools SA 2 Timetable Download. AP School Education announced Subject Wise / Class Wise High School and UP School for SA II Timetable. 8th, 9th Class SA 2 dates for Subject Wise. Telugu, Hindi English Math's, Physical Science ( PS ), Biology and Social Subjects Paper 1, Paper 2 District wise Download. 9th, 8th, 7th, 6th Class Subject Wise and Chapter Wise Syllabus Download. VI, VII and VIII classes One paper for each subject. VIII class Science has two papers ( Paper-1 Physical Science, Paper-II Biological Science) and remaining all subjects has one paper each. 60 marks Composite Telugu for Sanskrit composit course from class VI to X duration of the examination 2:45hrs. Which will be held in the morning session for all classes. 20 Marks Sanskrit for Sanskrit Composite course from class VI to X, duration of the examination is 1 hour which will be held in the afternoon session for all classes. Part- B (Bit paper) of the Question paper also distribute at the beginning of the examination along with Main paper. AP SA 2 Exam Dates - 6, 7th, 8tg, 9th Classes Summative 2 Exams April 4th to 23rd declared by SCERT. AP SA 2 Exams Revised Time table 2019 Download Summative II Exam Dates for 6th, 7th, 8th, 9th Classes in AP Schools. Andhra Pradesh UP/ High Schools SA II Exams New Time Table/Summative Exams Schedule 2019.